Why buy a Butterfly Embroidery Machines over the others? Our machine is built with much more expensive parts. We do not use the cheap parts that our competitors use. We use quality parts. We have been building a machine that you can use for at least the next 20+ years. The quality of our parts and the quality and details of the machine are probably the biggest advantage over the others. The speed, sound and embroidery quality of this machine, will beat the others. You really need to sit down and look at this machine detail and listen to it yourself. 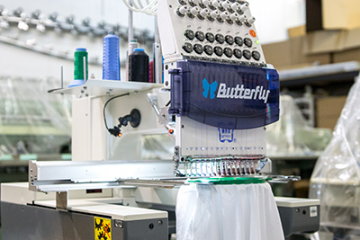 Butterfly makes even the most popular embroidery machine models, look a tad less desirable. 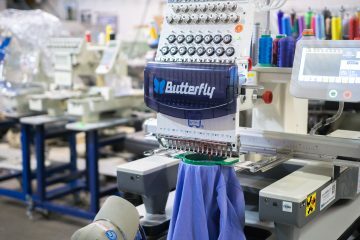 If you are looking for quality in your embroidery machine, then Butterfly should be your choice. You will not be disappointed with this machines quality. We have been selling Butterfly in the USA for over 15 years. The brand is 100 year old now. Ask the competitors which brands they were selling 5, 10, or even 15 years ago. They may have changed brands several times over and no longer support their previous machines. We have machines in the USA that were brought here in the early 1990s even before a distributorship existed in the USA. We are still going strong with Butterfly and only getting better. A lot of competitors machines are “Re-Branded”. These machines are sold by a factory that will put any name on them you wish. Butterfly has been around for a long time. We are not “Re-Branded” or “Relabeled”. This machine comes factory direct, built by Butterfly, an company founded year 1919. We work with a large network of embroidery machine technicians. If you need after hours support or emergency visits, then let us know and will do what we can to bend over backwards. We offer lifetime protection plans as well as free tuneups.